For many Filipinos, education plays a vital role in improving the quality of life. Despite this, many children struggle with their studies as they find themselves in tightly-packed, poorly-ventilated classrooms with dilapidated tables and chairs. The Department of Education (DepEd) estimates around 29 million students are attending classes this school year, an increase from the 27 million enrollees last year. As the student population continues to grow because of the K-12 program, the classroom shortage and inadequacy of school facilities has become an urgent issue that the country faces. Among other factors, a school environment can affect a child’s learning. Comfort and safety are basic considerations for a conducive learning environment, while stimulating surroundings with colors and creativity is also said to improve attendance, concentration and motivation. Teach for the Philippines (TFP), a non-profit organization that provides Filipino children with access to quality education by providing teacher support and development, has been helping address classroom shortage and inadequacy with the help of their Renovate to Educate (rED) program. This enables TFP to connect education champions with public schools who need help in classroom and facility rehabilitation. Starbucks Philippines, a TFP corporate partner, recently helped refurbish the facilities of Pateros National High School in Metro Manila and Col. E. De Leon Elementary School in Parañaque City. 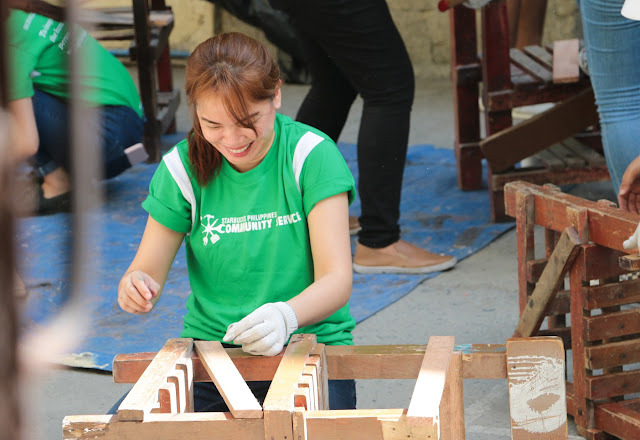 The volunteer Starbucks partners (employees) were tasked to rebuild classroom chairs and tables, repair classroom doors, repaint comfort rooms and even fabricate blackboards and book shelves. “We recognize the importance of education in our country and we see an opportunity to support this through Teach for the Philippines,” said Noey Lopez, Starbucks Philippines president. For the past four years, Starbucks Philippines has been supporting TFP through various initiatives, including the yearly Starbucks Planner promotion. 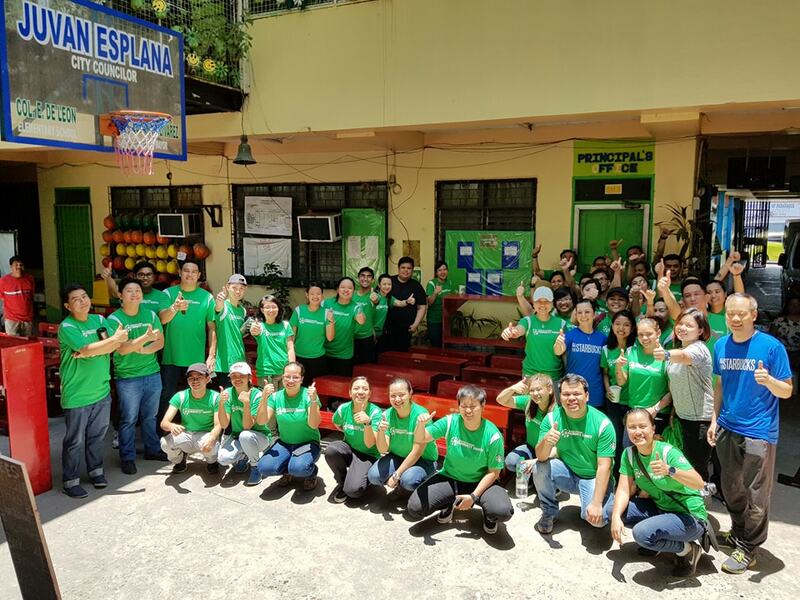 Through their partnership, fourteen (14) public schools from Manila, Laguna, Baguio, Cebu, Davao and Cagayan de Oro City have been renovated and rehabilitated, with the help of more than 800 Starbucks partners (employees). 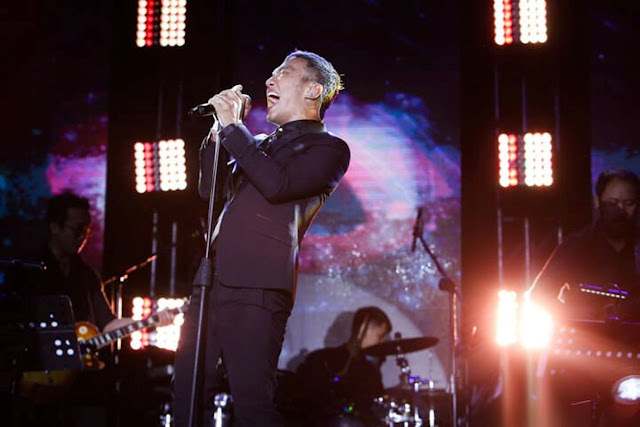 “It has always been a passion of mine to help people especially those who are in need. 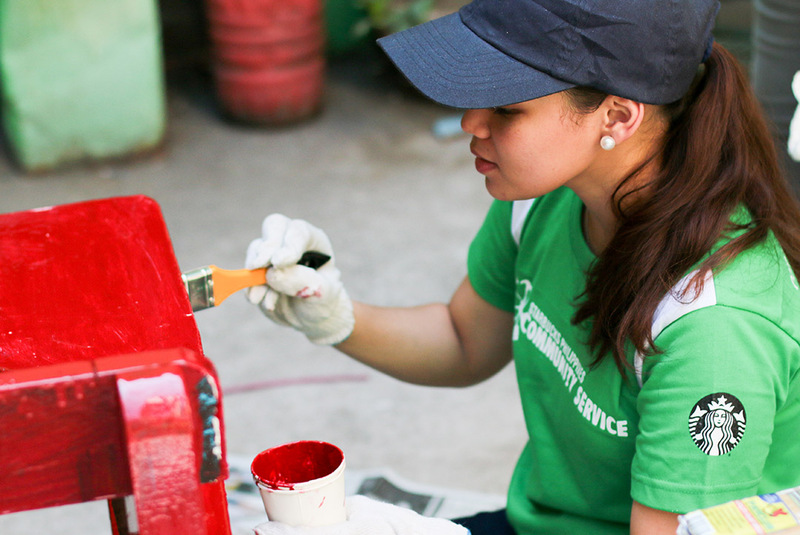 Fortunately, Starbucks is able to connect us with our community through Teach for the Philippines and Renovate to Educate. Through each build activity, I feel that I have made a difference by creating a better environment for the future generation”, said Ana Mendoza, store manager, Starbucks Reserve 14 Jupiter. Now, more and more Starbucks partners look forward to rED events as they deepen their commitment to help grow communities and improve lives. Aside from rED events, Starbucks Philippines also supports TFP’s Fellowship Program wherein young leaders are enlisted as Teacher Fellows to teach in public schools for two years; as well as Flipped, a program wherein public school students are brought on educational trips. 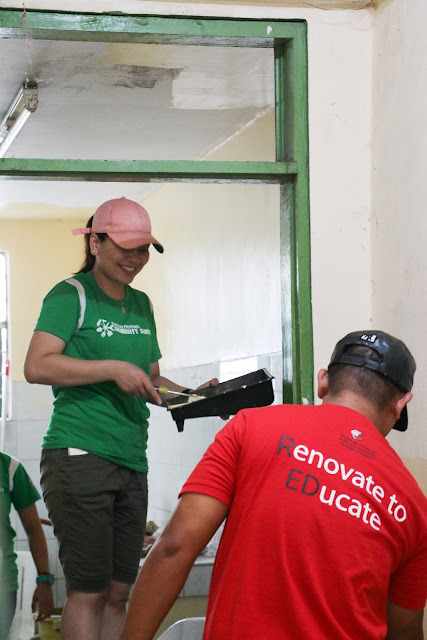 With Renovate to Educate, Starbucks Philippines and Teach for the Philippines remind us that “education is everyone’s responsibility” and that we should all be doing our part in making a positive impact.